Beyonce's new band features a great young drummer. That's no typo. 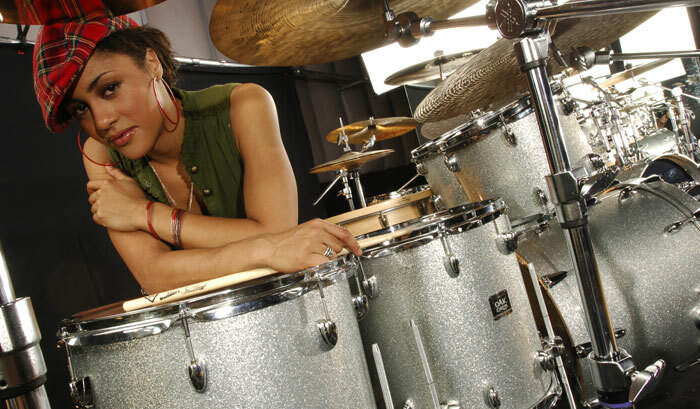 After the R&B diva decided to assemble an all-female band to promote her latest release, B'Day, she opted to recruit two drummers: Nikki Glaspie and Kim Thompson. They're a complementary pair: Glaspie is a solid groove drummer, seasoned in rock and funk. Thompson is a fiery jazz virtuoso. Both boast academic pedigrees: Glaspie attended Boston's Berklee College of Music, Thompson the Manhattan School of Music. Nikki casts their differing styles in elemental terms: "We're both very expressive, but in totally different ways. 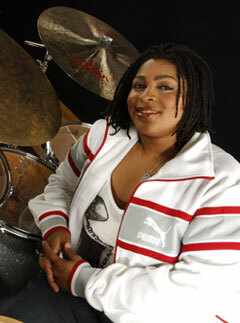 Kim is like fire--she plays with a lot of passion, and the sounds she pulls out of the drums are intense! I'm more of a pocket person, more straight-up. I can play with chops, but the way I've kept gigs in the past was by playing pocket. So I guess I'm more like water." The band has been leapfrogging from the Americas to Europe to Asia to Africa for promo gigs, but the world tour doesn't starts in earnest until next spring. In the meantime, the two drummers are still perfecting the ideal division of labor. "We just met three months ago, so we're still figuring it out," says Nikki, who grew up in a family of North Carolina ministers and honed her chops playing in church. "Basically, we try to share as much as possible. We try to play less so someone else can play more. I'll take a fill here, then Kim will take a fill there." "We switch out our parts a lot," agrees Kim, who first rose to prominence playing with jazz piano great Kenny Barron. "There are some rhythms that we both play the same, but usually we work out what gets played around that one rhythm. A lot of it is strategy, and a lot is discipline." One challenge for both players is the fact that Beyonce's show is performed in sync to backing tracks. "We both have the click in our ears at all times," says Nikki. "I haven't played to a click all that much, and then only in the studio." "It's constricting at times," admits Kim. "I'm used to having creative freedom, and there's not much room for that in this situation. And when there is, you almost have to be a mathematician or a scientist to make it work. The feel can't vary too much because of the click. So our feels have to be, if not exact, then pretty close. That can be tricky sometimes, because of our different musical backgrounds." "We just try to find a medium," concludes Nikki. When it comes to gear, the two share common ground: Both prefer Yamaha drums. "I love the sound of Yamahas," says Thompson, a longtime endorser. "I relate to these drums in a spiritual way. I love the Yamaha staff--they've been very supportive of my career. And Yamaha is international. I can go to Croatia tomorrow, and they can provide drums for me--and they have! That's why I'm staying with them as long as they'll have me." Glaspie is equally enthusiastic: "I love my Yamaha drums. First of all, they're so beautiful. Second, they sound incredible. I keep them set up in my room. First thing every morning when I wake up, I just geek out staring at them!" Nikki uses an Absolute Maple kit, a common choice for rock and pop players. But Kim opts for an Oak Custom kit. "I just like the sound of oak. It's woodier. You have to remember, I'm coming from the jazz thing, so my feel is a little more delicate, maybe a little more sensitive. I need something that's going to can take the most sensitive thing I play and make it more aggressive, but without making it become overwhelming." Both drummers say they have yet to settle on the perfect setup for the upcoming world tour. "I've been getting maple drums on the road," says Nikki, "but I have a birch kit at home, and that's probably what I'll take on tour. I'm using an Akira Jimbo snare right now, but I want to try other snares too." Kim says she'd also like to explore new alternatives: "I want to check out piccolo snares, deep-toned snares, jazz snares. A couple of bass drums. Tom-toms that can make a drum machine sound. And I'm definitely going to pick up a Yamaha Subkick. I'm interested in live instruments that can capture the sounds of the recording. I want to own those sounds for myself, instead of turning to a machine. I'm a big fighter for keeping the music in the musicians' hands."